You have been my true companion all these years.. You gave a meaning to my life. You helped me enjoy the beauty of the world through a different angle. You helped me distinguish, the good from the bad. You made me whole. I knew I would lose you some day. But not so soon. This has hit me out of the blue.. I remember the multiple times you have saved my life. Once from a domestic gas explosion. Another time from the dangerous fumes of ammonia and methane. Whenever someone tried to poison me through food , you came to my aid. I owe you my life..
You always gave me an edge over others. I would be the first one to know when mom was in a good mood. My garden has no meaning without you. In fact, it was all for you. The lovely vanilla plantation at home.. How will I ever get those childhood memories back, now that you are gone..
And our other friends.. Oh. how they would miss you!! Many of them have no existence without you. They have already started to tread their path to doom. When the first mishap hit you 10 months back, we all fought together to get you back. And you did come back..though it left you permanently damaged. We tried hard to keep you from a subsequent attack,which would impair you further. But sorry my dear.. I failed you.. I think I have really lost you this time.. Oh my dear.. “sense of smell”!!!! Reflections of my Mind – A Tribute!! Its been 5 years.. 5 long years since I wrote anything here.. Have terribly missed it. After all these years , it still feels special to be back. To pen down what clogs my mind. This is about a part of me.. This is about that something, I hold close to my heart. This is about .. Friendship.. All those friendships I have experienced. This is a tribute to everyone who have accompanied me in my journey so far in life. From the first friends as a toddler to the ones who accompany me for a tea outside office. This is an ode to each one of you. When I see my lil daughter play with her friend, it’s a reminder of the good times I had with the first friend that I remember of. Never did I realize until many many years later that he was older than me by 5 years. I still remember having bossed over him and always got my way in everything. A successful doctor today, and an even better human being, I am happy that I we are still in contact. The first girls gang I had was at the age of 5 . We 3 were nothing less than Power-puff girls (or so is what we thought). We were 1 yr apart in age, with me being the youngest. We even took strong resolves and oaths to be followed for the rest of our lives. One such was to never drink tea until the age of 12. A resolve which was followed to the word. We never met each other after the age of 8, when we relocated to India. After 18 long years, Facebook brought us in contact again. Happy to know how your lives have evolved! In college, did I meet a lot of wonderful people too. The ones who made the boring lectures very interesting. The ones who came over to my home on weekends.. The ones who invited us over for functions in far-off towns.. Ones who taught me its okay to be crazy. Ones who made me laugh without limits. Ones who were true pillars of support. Someone who stood up for me whenever I needed. Who helped me do everything I thought I could never achieve. Who taught me to believe, nothing is impossible J My dear Amritians.. we might not be in constant contact but you still live in my heart. Am106cs001 to am106cs066 and am106cs0502, I can never forget the time I spent with you. CEERI.. you brought a new set of wonderful friends with you. Awesome seniors.. Adorable juniors and my dear dear brothers (read as batchmates). If I have survived with you.. I can survive everywhere. J From bearing with my awful Hindi to my boring philosophies.. you have tolerated me day after day. Never have I felt left out, though I was the sole girl in class. I hope we remain the same crazy people we were, the 2 yrs we spent together. Always in touch and taunting each other. My dear friends at work.. Thanks for accepting me into the group within a matter of days . For trusting me with secrets. For giving importance in your lives. For making me feel at home. For being a motivation to come back to work each day morning. For all the outing we enjoyed. For all walks together.For the very wonderful girls trip to Andamans! For all the tea-break chats. I am not sure where life would take us, with ever-changing nature of our work, but I would never want to lose what we share with each other. Its rare to have friends inside our family . Meera.. you have and always will be that one person whom I can never get bored talking to. We both got busy with our lives, but we will always remain those kids who know each and every aspect of each other’s life. The ones who share the special bond of life, just like we shared Amma’s womb. We are so similar in all our differences. Couldn’t have asked for a better friend or sister than you. Friendship never evaded me even in marriage. Having married my very close friend, I didn’t have to explain the importance of all my friendships to him. Dileep.. we met as friends.. we married as friends. Though the dynamics of the relations have changed.. we still are friends.. and need to remain the same till death does us apart. Today you are our daughter’s best friend too. Mera jeevan kora kagaz kora hi reh gaya ..
Maut bhi aati nahi jaan bhi jati nahin. Pilani… PGRPE and one hell of a year…. This post is dedicated to all you wonderful people who made this one year special in Pilani. 2. I was the only female candidate who made it to the merit list in a class of 10..<sigh..>. The course coordinator had sent instructions on how to reach Pilani from Delhi. Since we had no acquaintances in Delhi and Pilani was a 5 hour journey from the capital we decided to spend the night in the airport itself. That was a hell of a night without any sleep. The next day morning we reached the famous Kashmiri Gate Interstate Bus Terminal only to be “awed” by the filthy look it had. There was not even a single bus which looked boardable. We finally boarded the 9am bus to Pilani and the travel was tiresome on that hot and humid day. But then I got to see poverty for the first time in my life. Hailing from the state of Kerala which is famous for its uniform development, I had no idea that there were people really living in shacks all over the northern part of my country. I was under the impression that the slums of Mumbai and the like were just a minority. And on that day I realized that there could be advantages too to the socialist attitude that prevailed in my state. The weekend passed without much to do. Just roamed about in the BITS campus which is adjacent to our’s. Exchanged rings with my fiancé <blush>. Met my college friend in BITS and most of the time slept in my room. On 9th morning with lots of anxieties and hopes I reached the conference hall of our lab. There I found 10 new faces(none looked friendly or inviting). I still remember the only few people who even had the interest to talk to me. But all that changed as time passed by. We became best pals. But today I thank all the following people (names are not included) who made my day on 9th August 2010 [a] the one who gave me the first smile [b] one who gave me the first handshake [c] the one who lend me a pen when in need(though he did it with the weirdest of all expressions) [d] the ones who made me feel most welcome by saying they were hoping for a girl from Kerala to join to complete their group … and all others who made me feel at home in this far-off land. leg, got my ATM card blocked for 4 months, bought a cycle which tortured me everyday, endured severe winter and summer , attended a live concert..and did so many more crazy things which I never thought I had the capability to do (thanks to all my dear brothers).. Pilani taught me a lot of lessons and gave a handful of awesome friends. As I complete one year of stay here I just want to tell you guys (classmates, batchmates and seniors(in seniors especially my ‘Di’s)) I love you all really a lot. You are the people who helped me survive through bad times and laughed with me during good times.. You are ones who stood with me through thick and thin.. You made my year soooo SPECIAL…. How many times have you lost all control over yourself ? How many times have you blasted out on someone and badly regretted having done so? I am sure there will be a very low minority who don’t experience these situations at least on a weekly basis if not on a daily basis..And I am no exception. But an experience which I had a few days ago got me thinking about patience and the importance a patient listening and patient explanation would have on someone’s life. Most of us might have heard of the story which signifies how patiently our parents had taught us when we were too young and immature and how we lose our control when they behave like children in their old age.. All of us feel the depth of the story and understand the moral though our behavior never changes. Life would have been so easy if people changed their behavior after being impacted by stories. It I real-life incidents which can change a human being. After going through the above 2 paragraphs if you are expecting some really emotional and life-changing incident you are sure to be disappointed. J I write this post as a dedication to the patience one of my teachers(or you can read guides) showed towards me. I have always been a very impatient person when it comes to teaching anyone. It is a well-known fact among friends and family that unless you are a very fast learner you will not be able to learn anything from me. I always used to complain how someone could be so illogical and for me any learning would happen only through logically analyzing thing let it be learning how to operate a mobile, connecting a cd player, driving or even cooking. But then I met a very humbling personality who changed the way I perceive things. When I joined for a PG course in Semiconductor Electronics (and specialized in Photonics) after having a background in Computer Engineering I didn’t have much idea how I would be able to cope with it but thanks to some extremely motivating personalities ,I was able to survive in this whole new world of electronics research. When I took up a self study course in Diffraction Gratings without having any background in electromagnetism that too under a guide who is another part of the country everyone called it a wild-call. Though I was fairly confident that I will be able to pull it through I started losing confidence as time passed by. That’s when my guide made a one week visit to my lab. Each day he would spend time with me teaching me the very basics of electromagnetism and that’s when I realized that learning something which we are totally unfamiliar with is extremely difficult and I remembered how my mom would have felt when I used to try to teach her how to operate a mobile or to drive a car. It was totally new to her and she used to make all kinds of mistakes just like what I was doing with fields and waves. 🙂 I learnt the most important lesson that unless you are fundamentally clear about the subject or activity there is no way you can learn it howmuchever hard work you put in. Now I am a changed person. I have promised myself that next time I try to teach someone I will definitely be patient and make sure that the I put in my 100% effort to make that person learn. And that itself makes me feel very relaxed and motivated.. Thanks for the patient reading. 🙂 Have a good day! Sooner or Later Though You Always Have to Wake Up….. This write-up will be better understood by those readers who have seen the movie Avatar by James Cameroon. And I really suggest that those who have not seen the movie please do watch it. Its worth the effort. I decided to watch the movie Avatar just because it was directed by a famous director and there was a lot of hype about the movie all around. Just like any other normal viewer..:). But half way through the movie I started understanding the message the movie was trying to convey. I started understanding that it was one of the most relevant movies I have seen in recent times. The movie talks about the greed of human beings. About what wonders nature can do.. About the extent to which human beings can deteriorate to be the ruler of all resources. . The movie is about how humans(refered to as Sky-people) decide to mine rich natural resources from another planet named Pandora and the natives of the planet known as the Na’vis trying hard not just to safeguard the resources but also to preserve the nature of their homeland. They fight till their death to save their planet. From the surface it looks like any other normal alien movie but deep down it sends a message to the whole human race to fight for the planet we live in. Towards the climax of the movie the hero prays to the Na’vi Goddess and thats the dialogue which I felt was most relevant ..“See the world we come from. There’s no green there. They killed their Mother and they’re gonna do the same here“. Very True. We have killed our Mother Nature who protects and preserves us. Our greed is never going to end. It will only keep on increasing until we ourselves become the reason for our downfall. Take for instance the Copenhagen Climate Change Summit. No one was ready to take a stand that would save the Earth. All the countries thought just about themselves and thus even a consensus could not be reached, leave alone a solid protocol or agreement. Thus it turned out to be a failure. Indians and Africans, who are considered to be inferior races by others, have a rich heritage which we can be proud of. These two races have always worked in harmony with nature and done all that could be to safeguard it. But now what has happened to us?? Just like the Na’vis in the movie shouldn’t we too continue doing what our ancestors have done? Should we too end up being held responsible for the brutal murder of our Mother? Or should we stand up against the murderers? Its for us to decide. Lets not forget that the green cover is necessary for the human race to survive. Just like the forest decides to help the Na’vis to save their homeland Nature will appreciate any effort made by her children and help to drive away the intruders. By the time the destroyers have realized their mistakes it’ll be too late. So lets all consider it our obligation to take up the responsibility and help save our Mother. Fight for our Mother. Without her we have no identity. Its she who preserves us. We are like babies; stupid and ignorant. Lets grow up a bit for the sake of our Mother. So its time for us to wake up..
Save our Mother!! Save Nature!!! 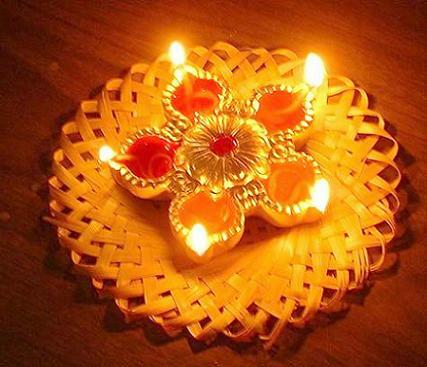 Diwali… The festival of lights..
Diwali is one of the most lively festivals in India and even the whole world. With so many chirags lighting up the whole place as well as our hearts.. The sound of firecrackers which fill the air.. And the best part.. THE SWEETS!!! I just love this festival.. But when we celebrate a festival it is important to know the significance of it as well as the legend associated with it. Lets pledge to drive away the darkness!! India is a land of festivals where you will see at least one major festival each month. Deepavali (or Diwali) which literally means “rows of lamps” is one of the four main festivals of India. Throughout the world all Hindus celebrate Deepavali or Diwali with great pomp and enthusiasm. The celebration of Diwali lasts six days, beginning on the 12th day of the month of Kartik (as per the North Indian lunar calendar). The day before Diwali, in order to evoke the grace of God, women fast. It is not that God wants you to go hungry or takes pleasure in your suffering – the principle is that you gain only by giving up. That evening, devotees worship Gomata (the cow) and her calf and feed them special food. Women pray for the welfare of the entire family. This holy day is called Vasubaras. In North India, the Govardhana Puja occurs on the fourth day of Diwali. Devotees in the North build large mounds made of cow dung, symbolising Govardhana – the mountain that Krishna lifted up with his finger to save the villagers of Vrindavan from rain – and decorate and worship them. North Indians observe this day as Annakoot, or the mountain of food. The fifth day of the festival called Bhaiyya Dooj celebrates unique and fun customs. Every man dines in his sister’s house, and, in return, presents her with gifts. North India calls it Yama Dwitiya. Thousands of brothers and sisters join hands and have a sacred bath in the river Yamuna. There is a legend about a king of Prag-Jyotishpur, named Narakasura. He was a powerful king who misused power to harass his subjects. Sri Krishna destroyed this oppressive asura king on this day. Unjustly imprisoned people celebrated their freedom with friends and family. The citizens celebrated their deliverance from Narkasura’s reign by lighting lamps. Deepavali falls on a no-moon day – in fact the darkest day of the year. The illuminations and fireworks, joy and festivities, are to signify the victory of divine forces over the powers of darkness. On Deepavali day, triumphant Sri Rama is said to have returned to Ayodhya after defeating Ravana, the asura king of Lanka. In order to shelter the gopis and gopas and their cows from the torrential rains sent by Indra, Krishna lifted a hill near Mathura called Govardhana with his finger and sheltered all the people for a period of seven days under it. By then Indra saw Krishna’s greatness and asked him for forgiveness. The dharma of fire is the same wherever it is: in a poor man’s house, in a rich man’s house, in America, in Antarctica, or in the Himalayas. It gives light and heat. The flame always points upwards. Even if we keep the lamp upside down, the flame will burn upwards. The message is that our mind should be focused on the Atman, the Self wherever we are. The lamps remind us of our dharma to realise our divine nature. Its recession time !! And we students who have reached the final year of our BTech degree (especially CSE and IT) are in real trouble..
As in all other colleges the placements in our college are expected to be bleak.. But thats when the CCR(Center for Corporate Relations) of our college decided to encourage us to concentrate on higher studies rather than remain disappointed about placements. I’m uploading the data which we collected about the GATE exam. It contains the exam details, pattern, syllabus, important dates etc.. Hoping that it will help all u guys who are interested in taking up the exam..